↑ A cease-fire in America was proclaimed by Congress on April 11, 1783 pursuant to a cease-fire agreement between Great Britain and France on January 20, 1783. The final peace treaty was not signed until September 3, 1783, ratified on January 14, 1784 in the U.S., and final ratification exchanged in Europe on May 12, 1784. Hostilities in India continued until July 1783. ↑ अ आ इ ई Duncan, Louis C. MEDICAL MEN IN THE AMERICAN REVOLUTION (1931). ↑ अ आ Jack P. Greene and J. R. Pole. A Companion to the American Revolution (Wiley-Blackwell, 2003), p. 328. ↑ अ आ Jonathan Dull, A Diplomatic History of the American Revolution (Yale University Press, 1985), p. 110. 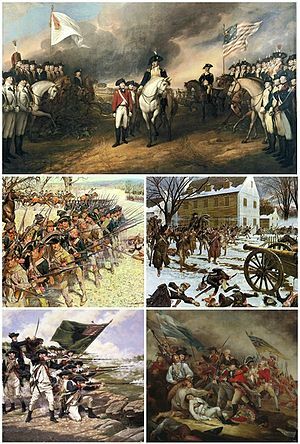 ↑ "Red Coats Facts – British Soldiers in the American Revolution". totallyhistory.com. ↑ "Spanish casualties in The American Revolutionary war". Necrometrics. ↑ "Eighteenth Century Death Tolls". necrometrics.com. अभिगमन तिथि January 7, 2016.